Happy almost Independence Day! Hope everybody is having a great holiday weekend. This first link should put you in the mood. Or not. 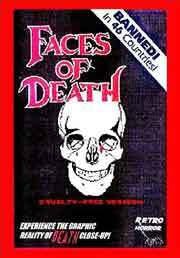 This is a little different than my typical Must Reads, but I thoroughly enjoyed Jack Sargeant reprinting his history and analysis of the ’80s “death film” genre, most famously epitomized by the film Faces of Death. I’ve never seen any of these films — nor do I want to — but Jack’s conclusion is fabulous. Filmmaker Waylon Bacon has written a fantastic overview of the Berkeley film scene for CineSource Magazine. Fangoria interviews director Rona Mark on the eve of her awesome Strange Girls finally getting a DVD release. FINALLY! GorePress.com has a really nice interview with Paul Campion about his first feature film, The Devil’s Rock. IndieWIRE interviews Mike Plante about his new Cinemad distribution venture, who, strangely enough, isn’t in it for the money. Tho’ we all hope the green starts rolling in. GreenCine Daily turns to filmmaker Zach Clark to pen a rave write-up of the 1973 cult classic The Baby. Speaking of Zach Clark, Box Office Magazine gives a fantastic review to his latest feature film, Vacation!. A Serbian Film continues to offend and divide audiences. The Age has a great article on the film that also examines other examples of extreme filmmaking and Australia’s history of censorship. NPR yields the floor to Jeff Krulik who relates the history of Heavy Metal Parking Lot once again. I haven’t posted one of these yet, but I do love Filmmaker Magazine’s monthly VOD guides. I’m linking to July’s since it says the experimental film hit Uncle Boonmee Who Can Recall His Past Lives will be available soon. Making Light of It eulogizes the late filmmaker David Brooks, whose The Wind Is Driving Him Towards the Open Sea is a serious ancestor to Terrence Malick’s Tree of Life. Bob Moricz wrote a terrific analysis of the classic Wes Craven horror flick, Last House on the Left. This is a rarity: Blood, Sweat & Angels conducts an email interview with Crispin Glover. It reads like one of his Q&A sessions at his screenings: Ask a question and he answers with his own agenda. Meaning: It’s highly entertaining. Ever wonder how one would animate vomiting? Patrick Smith has some tips. Chris Hansen has finished shooting Where We Started, but a great journal post to read of his is the day before last day of shooting. Jessica Oreck plays in some reindeer games. Robert Putka has resorted to selling himself on the Internet. No, not like that! Phantom of Pulp reviews Koji Wakamatsu’s war drama film Caterpillar. Chopping Mall has a fun write-up on the goofy ’70s horror flick Island of the Fishmen, or known in the U.S. as Screamers. Phil Solomon reprints an old article of his in which he muses upon a single frame of his film Clepsydra. Rhizome takes a look at Melanie Gilligan’s Popular Unrest, which opened the Migrating Forms fest this year and can be viewed online. Plus, and I just love this: Looking at sci-fi movie corridors. Lenny Lipton has a modest proposal about the future of 3-D movie projection. Fast Forward Weekly interviews curator and theater manager Pete Harris who is departing from Calgary’s Plaza Theatre, where the Calgary Underground Film Festival is held. The late, lamented Esotica Erotica Psychotica says it’ll be back as a regularly published film journal. If you want to contribute to the first “issue” devoted to filmmaker Andrzej Zulawski, go to that link and inquire. Not underground, not even close. But, this is hilarious: Nathan Wrann posts a photo of a flyer a multiplex posted outside the theater playing Transformers: Dark of the Moon. You have to read this!